In Abruzzo there is a saint to be invoked for any occasion or need. In the first place, in speaking of this region there is one observation to be made. Rome has always been considered geographically as the center of the peninsula, so much so that Rieti, a town near the capital, is nicknamed the “umbilicus italiae” (umbilical cord) of Italy. It is therefore interesting to note that despite the fact that some parts of Abruzzo are even further north than Lazio (where Rome is located), this region has always been considered, curiously enough, a southern area and that it was part of the Kingdom of the Two Sicilies; and its inhabitants were known either as Papalini, that is from Lazio which depended on the Papal State, or alternatively as Regnicoli because they were subjects of the King of the Two Sicilies. This situation of being an appendage to a State, and hence distant from the “central government” (to use a modern concept) as well as being removed from the important commercial routes that passed through Tuscany, Lazio and the Campania, had the result of making the population of Abruzzo very reserved and attached to ancient occupations, such as for example herding, an occupation that is still strongly present in this region, while in practically all other parts of Italy it has been either abandoned or completely industrialized. As a result of this geographic isolation, regional traditions born during the medieval period, or even much earlier, remain rooted in the culture of the population, because they were never demolished by the disbelief of the modernists or the progressives. Now that there is a tendency to restore ancient festivities, these traditions have received a new lease on life and attract considerable tourist interest. Returning to the isolation of this region, I would like to underline that among the most beautiful monuments of Sulmona, together with the acquaduct of Frederick II and the splendid churches, in particular SS Annunziata, there is the medieval “Porta Napoli” (Naples Gate) that rises at the exit of the city at the beginning of the very road which led to the capital of the Kingdom. Certainly, if one needed to travel personally to visit the sovereign in order to request a favor or seek justice, the trip took weeks and weeks. And since it was possible that at that time the king might be in another capital of the kingdom, that is Palermo, prudence suggested that it was better if possible to avoid such trips which were often very dangerous. One of the most suggestive ceremonies in Sulmona is the procession of the “Cristo Morto” (Defunct Christ) that takes place the evening of Good Friday. In typical medieval costumes, or with their faces covered in sacks with only two slits to allow them to see, all of the characters involved in the martyrdom of Christ walk in a solemn parade, making sure that their steps are perfectly synchronized so that the sound of their feet make a sinister and funeral-like sound, which gives the impression of a monster-like creature creeping towards a place of execution. Exactly two days later, that is the morning of Easter, there is another celebration that takes place called “La Madonna che scappa in piazza” (the Madonna who flees in the piazza or main square). A statue of the Virgin Mary, carried shoulder-back, is taken to the door of a church, where the question is posed regarding the location of the body of Her Son whom she believes dead. She is then informed that her son lives and awaits her in another church. The statue is carried, running, along the road to the place where her son is to be found, simulating during the race a manifestation of superhuman joy, until reaching the statue of Christ. If in the race the statue falls to the ground because of a mishap among the porters, this is interpreted as a sign of impending disasters in the coming year. Sulmona is known for being the birthplace of Pietro da Morrone, a saintly monk that became Pope with the name of Celestino V and then, unable to stand the intrigue and problems of the Roman Papal Court, decided to resign, the only event of this kind in the millennium history of the Church, up to 2013 and Pope Benedict XVI’s decision to do the same. Because of this action, called by Dante “viltade”, the poet relegated Celestino V in the inferno, while the Church proclaimed him a saint. His successor was Bonifacio VIII, quite different in terms of saintliness. He was a pope that created so much agitation, that he too was unique in the history of the church, having been slapped by the emissaries of the King of France, Philip II, an episode which passed into history as “lo schiaffo di Anagni” (the slap of Anagni). The most typical product of Sulmona is the confetti confectionery (sugar coated almonds). This product is the result of secular traditions and the oldest factory, that of Mario Pelino, has established a museum that shows, alongside modern equipment, all the ancient machines, centuries old, used to make confetti of every type and color, for example in silver and gold for wedding anniversaries and red for graduation, as well as artistic objects, such as the branches of a peach tree in flower. Young couples from all over Italy, approaching the date of their wedding, come to this little town to purchase the confetti, not so much for the savings in buying directly from the factory(which are in fact rather limited), but rather to observe a secular tradition: one might call it a pilgrimage for good fortune. 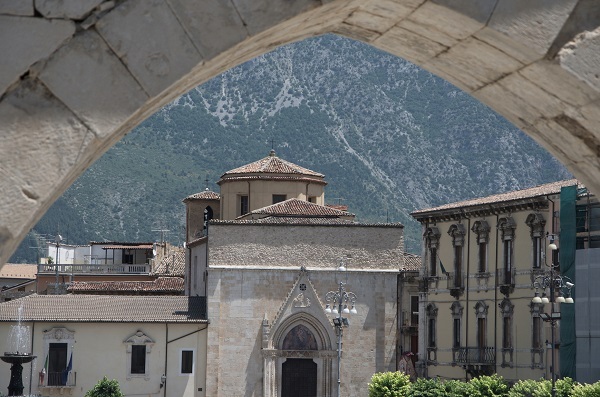 But the thing of which Sulmona is proudest is having been the birthplace of the famous Latin poet Ovidio, who celebrated with the famous Ars Amatoria, and the adventures of imperial Rome, and who created beautiful verses regarding the legends of gods and heroes in his Metamorphoses. This foremost writer is also remembered in the coat of arms of the city that carries the initials of one of his phrases S.M.P.E. or “Sulmo mihi patria est”, that is, Sulmona is my homeland. The misfortune of this man was the coming into power of the emperor Ottaviano who wanted to restore the “Pax Augusta“ and a code of rigid morality to a world that had been until then subject to continuous wars. At this point Ovidio, who had glorified the pleasure seeking Rome, was no longer welcome. The emperor exiled him to the Black Sea where he died after continuously mourning the loss of his beloved Rome! Given the already mentioned isolation of the Abruzzo region, its traditions have persisted since the medieval period and have been carefully cultivated. One of the most typical events takes place at Preturo, where every year in the presence of a large audience from all over Italy, there is the re-enaction of a legendary story of an infant, son of a poor herdsman, who was taken from the field where his parents were working by a fierce wolf that carried him to a cave to devour him. However, because of divine intervention, a figure of the Madonna appeared, and the beast restored the child safely to his parents. The actors are from the local population, and the child, formerly a doll, is now a real child allowed, with some trepidation, by his parents to become an actor for a short period of time. But the town that more than all others preserves certain secular traditions is, in my opinion, Cocullo, situated near the picturesque lake of Scanno, and the beginning of the so-called “Piana di Sulmona”. In this town, S. Domenico is venerated, and his festival falls on the first Thursday of May. Needless to say, if this day coincides with 1 May, the festival of the workers, already one day ahead it is impossible to enter the town, such is the influx of tourists and faithful from all parts of Italy. This Saint is reputed to protect against two things: against toothaches, and hence all types of dental ailments, and also against snake bites. According to a pious tradition, in order to obtain protection from toothaches it is necessary to ring the bell of San Domenico in the Church dedicated to him, but the bell must be rung by tugging the little chain to which it is attached by one’s mouth. At festival time, the queue of persons is very long. In a moment of religious fervor, the writer of this note got into a long line, patiently waiting to absolve the rite of the bell wringing with the mouth. However, I am not ashamed to say that I did what might be considered a very unreligious action. Noting that in the line ahead of me, there were a lot of drooling and toothless old women, when it was my turn I did not hesitate to pull the chain by hand, protected by two tissues, and afterwards I quickly washed my hands with lots of soap and water. I hope that because of the lack of respect for San Domenico I will not be condemned to the fires of hell, but at least can hope to go to Purgatory. But the most fascinating exhibition on that day is that of the Serpi (snakes) and Serpari (those who handle the snakes). 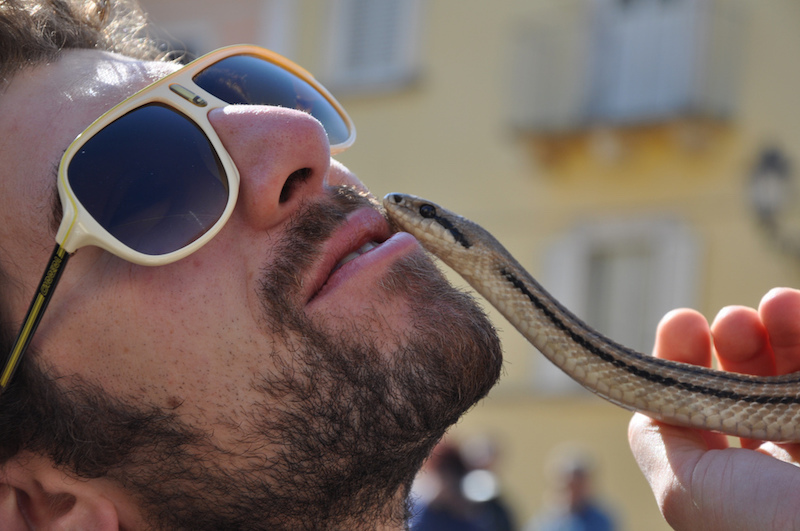 From the beginning of April the inhabitants of Cocullo comb the countryside to capture the snakes that emerge from their holes into the sunlight because it is the mating season. There are snake handlers that can have as many as 30 snakes entwined about their necks. When, at the end of a solumn Mass, the statue of San Domenico is carried out in procession, the handlers place all the live snakes around the neck of the statue, where they crawl about and move continuously, but never detach themselves. 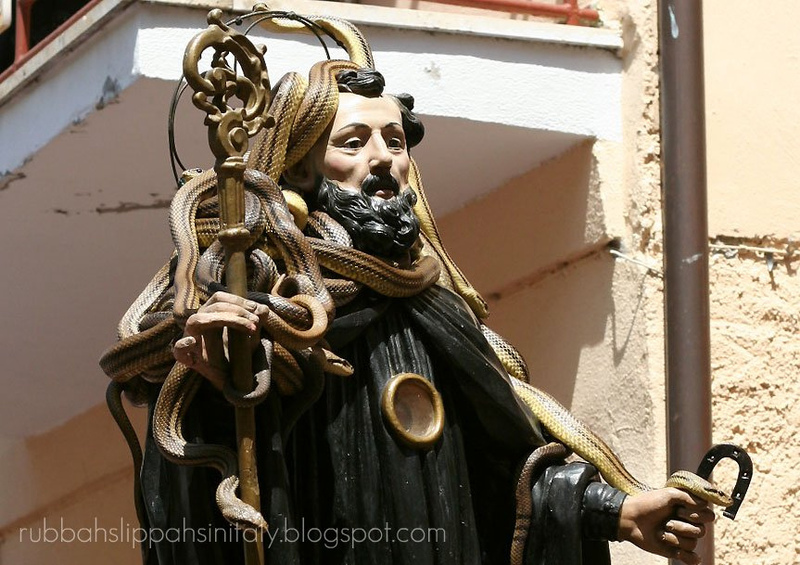 And the statue of the saint with all the snakes on it is carried in procession throughout the streets of the town of Cocullo, greeted by song and prayer. Some of the handlers, out of devotion, hold the snakes in their mouths. You can see in the photograph the author of this article, who having become used to the numerous festivals, is fearlessly carrying snakes about the neck. Hence, as I said at the beginning, there are saints for all occasions in Abruzzo!